Dr. Jordan B. Peterson, who has two children, threatened Wednesday to sue a Bloomsburg University of Pennsylvania professor who called him an incel and a white nationalist. The University of Toronto professor and author of “12 Rules for Life: An Antidote to Chaos” threatened to sue Bloomsburg professor Wendy Lynne Lee after she called him an “incel misogynist” and “committed white nationalist,” reported Mic. Lee deleted her tweet shortly before The Daily Caller News Foundation published a Wednesday article but not before TheDCNF captured a screenshot of it. “Please immediately retract all of your defamatory statements, have them immediately removed from the internet, and issue an apology in the same forum to Mr. Peterson,” Peterson’s attorney Howard Levitt said in an email to Lee obtained by Mic. Lewitt threatened to take legal action if the professor did not comply. “AS PER THREAT TO SUE FOR LIBEL, I HEREBY APOLOGIZE TO JORDAN PETERSON FOR REFERRING TO HIM AS AN INVOLUNTARY CELIBATE (INCEL), A MISOGYNIST, A COMMITTED WHITE NATIONALIST, AND SOMEONE WHO HAS DESCENDED INTO RANK BIGOTRY,” Lee subsequently posted to Twitter. “That’s some apology,” Peterson noted to TheDCNF. But Levitt alleged that Lee’s stature as a professor with a Ph.D. means her claims bear more weight than do accusations made by other individuals. 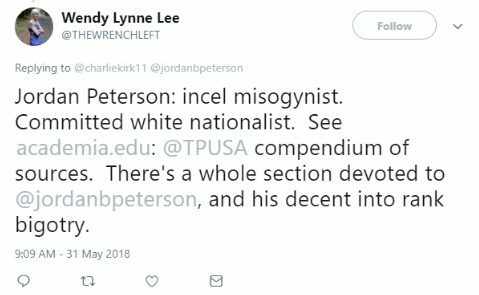 Lee maintains a bibliography of “white nationalist sources,” in which she includes Peterson, Jewish conservative figures Ben Shapiro, David Horowitz, Jewish podcast host Dave Rubin, and right-wing author Ann Coulter.